The maximum winter extent of Arctic sea ice reached another all-time low this year, according to satellite measurements by the National Snow & Ice Data Center, which has been tracking conditions via satellites for 37 years. Spanning 14.52 million square kilometers ( 5.61 million square miles) as of March 24, the winter 2015-2016 maximum was reached 12 days later than the average from 1981-2010. A late season surge is still possible, NSIDC noted, adding that it will post a detailed analysis of winter sea ice conditions in late April. 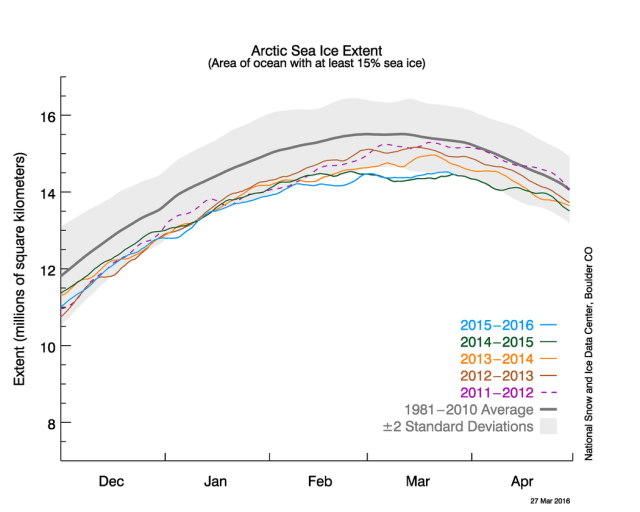 Record lows in winter maximum Arctic sea ice have been set in 13 consecutive years. The 2015-16 maximum came in slightly lower than 2014-2015, the previous record low. The March 24 maximum was 13,000 sq. km (5,000 sq. mi) lower than 2014’s previous satellite record low and 1.12 million sq. km lower than the 1981-2010 average. The date a maximum in Arctic sea ice area has been reached has varied over the years. It has occurred as early as February 12 in 1996 and as late as April 2 in 2010. Scientists’ ability to accurately measure the extent of Arctic sea ice has improved greatly thanks to the advent of satellites carrying remote sensing technology in the early 1970s. NSIDC relies primarily on NASA’s Advanced Microwave Scanning Radiometer-Earth Observing System (AMSR-E) installed on the space agency’s Aqua satellite, and the Special Sensor Microwave/Imager (SSM/I) on a Defense Meteorological Satellite Program satellite, the Center explains on its website. Generally speaking, Arctic sea ice cover reaches its maximum extent sometime in late February or March. A period of melting then begins and extends through the Northern Hemisphere’s summer months, typically reaching an annual low in early or mid-September. 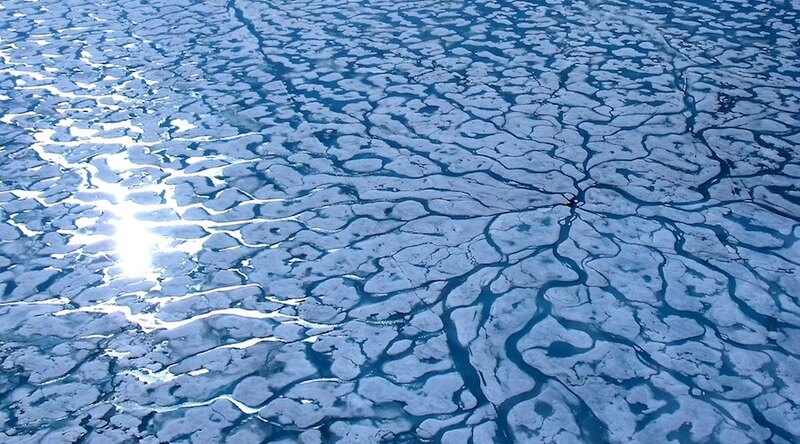 “The maximum marks the point when the Arctic shifts from a freezing period into the summer melting period,¨ NSIDC scientist Walt Meier explained. Zooming in more closely on 2015’s data, NSIDC found the maximum winter extent of sea ice was below average everywhere in the region except in the Labrador Sea, Baffin Bay and Hudson Bay. In contrast. the winter maximum in the Barents Sea was especially low. Warmer than average Arctic winter air temperatures are partly to blame. Air temperatures from December 2015 – February 2016 were higher than average throughout the region. Averages at the North Pole and from the Kara Sea towards Svalberg were more than 6 degrees Celsius (11 degrees Fahrenheit) above average. Higher average air temperatures continued into March from the Pole toward northern Greenland. They were 12 degrees Celsius ( 22 degrees Fahrenheit) above average north of Svalbard, Sweden. The persistence of warm southerly winds in the Kara and Barents seas were other contributors. They have helped keep the Arctic sea ice edge north of its typical position. The influx of warm Atlantic waters from the Norwegian Sea also played a role in limiting winter sea ice formation. NSIDC scientists expect the onset of seasonal melting will begin early this year as a result. Early surface melting in the high Arctic raises the likelihood that summer sea ice cover will be lower than normal, adding another year to another seasonal trend. Did you know that the earth’s core is hot? And not influenced by CO2? Yes, of course the Earth’s core is molten iron. This is hardly a secret. It is why the Earth’s tectonic plates move as they do. The way you’ve worded your comment I’m not sure if you’re asking if CO2 has no influence on that molten core, but I assume you’re implying that CO2 has no influence on the part of the planet where we live. And of course that isn’t true. Don’t take it from me, ask any of your favorite climate “skeptics” and they’ll explain to you the natural carbon cycle and the greenhouse effect, irrespective of any human influence, that makes the Earth’s surface habitable. Pretty much grade school science stuff. I’m glad to see you’ve subscribed to the newsletter. I hope you learn something. Thanks for the comment!